It's Halloween in the Shutters home, and 9-year-old Trenton and his mom, Renee, love candy as much as the rest of us. But there's a big difference in the candy they buy: no artificial colors at all. "I do not eat foods with artificial dyes in them," Trenton said. His parents say Trenton used to be a "problem child," with regular meltdowns and fits. "I'd start throwing tantrums, no matter what it is," he said. That's when Trenton's mom read about a possible link between artificial dyes in food and bad behavior in kids. "And I'm like, food coloring? You mean food coloring can cause this?" Renee said. "I just never would have expected that." So she stopped giving him foods with those dyes, and says the results, while unscientific, were incredible. Within days, Trenton was a different kid. "We saw amazing results at school, we saw amazing results in his attitude, he was happy; no more meltdowns at all," Renee said. "It was awesome." In partnership with Center for Science in the Public Interest, Renee is now petitioning Mars via Change.org to take those artificial dyes out. With Halloween coming up this week, many people are stocking up on candy like M&M's, which come in many different colors thanks to artificial food dye. But researchers say there may be a link between those dyes and behavior problems in kids with certain conditions. The FDA has been looking into these dyes for years. While they found that they're not toxic and don't cause hyperactivity in kids, in a 2010 report they concluded: "For certain susceptible children with ADHD and other problem behaviors, the data suggest their condition may be exacerbated by ... artificial food colors" because of a unique sensitivity. Michael Jacobson runs the watchdog group Center for Science in the Public Interest. He says these dyes come in everything from candies to fruit drinks, waffles to macaroni and cheese — even foods that aren't colorful, like marshmallows and white frosting. "They're in thousands and thousands of foods, making it very difficult for people to avoid them," he said. Jacobson says that in Europe, where food makers are required to put large warning labels on products containing artificial dyes, "in general they have gotten rid of the dyes, maybe replaced them with natural colorings." So why doesn't that happen here? "Because of profits. Dyes are cheaper than natural coloring," Jacobson explained. "It's about money." Mars, the maker of M&M's, and the Grocery Manufacturers Association told us the overwhelming majority of studies "confirm the safety of these artificial food colors" (see full statements from both below). They said they're always reviewing new studies to produce "the safest possible product" and Mars is "continuing the explore the use of natural colors." But they still don't use natural colors in M&M's here. So Trenton and his mom are now petitioning Mars to take those artificial dyes out. "I changed to no dyes and I just felt so good," Trenton said. The FDA says more research is needed, and it will issue new findings about food dyes at the beginning of next year. In the meantime, parents of kids who already have ADHD or behavioral problems can check the ingredient labels of products they're concerned about; all the dyes have to be listed on the packaging. Some parents told us that when they experimented with removing these dyes from their kids' diets, it took a couple of weeks to notice any difference in behavior. Get more information about the Shutters' petition to remove artificial food dyes from M&M's here. “We are aware of the petition. We are committed to manufacturing and selling products that meet the highest standards of quality and food safety. All the colors we currently use in our products comply with our own strict internal quality and safety requirements as well as all applicable laws, regulations and safety assessments relating to colors added to food. All colors are declared on the label in accordance with applicable national laws and regulations. We are constantly evaluating and updating ingredients based on consumer preference, new technology and scientific information. It is important to understand that certain considerations may need to be made when selecting natural colors. For example, the use of plant or animal-derived ingredients may cause allergies, and may not comply with a vegan, kosher or halal diet. 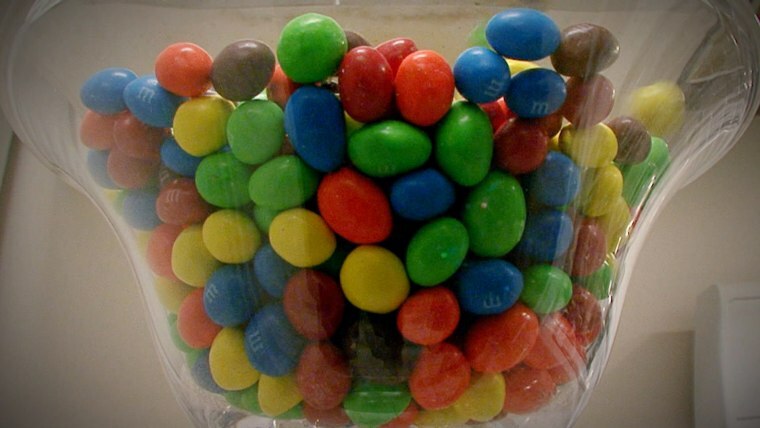 M&M’S continues to use a mix of naturally sourced and artificial colors in the EU. We have absolute confidence in the safety of all the ingredients we use, as do the U.S. Food & Drug Administration (FDA), the European Food Safety Authority (EFSA) and other leading food safety regulators globally.